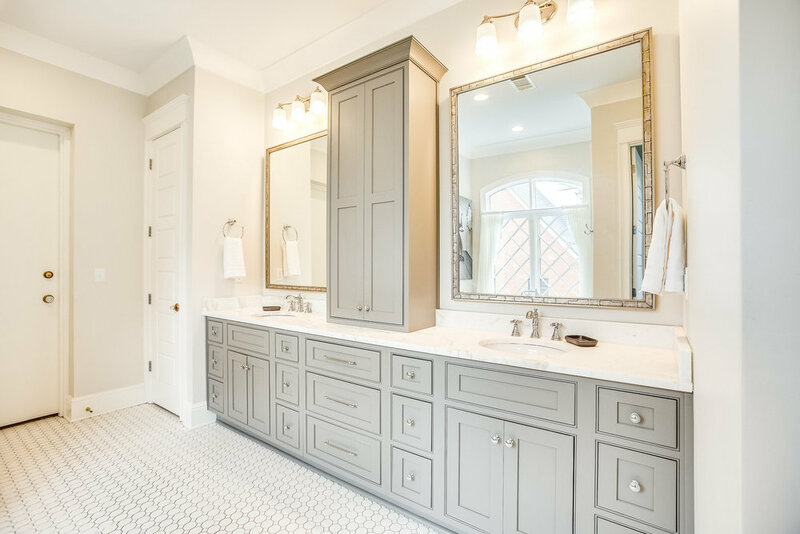 The master bathroom for this Highlands neighborhood home in Tuscaloosa has historical elements in keeping with the archetypal feel of the neighborhood. 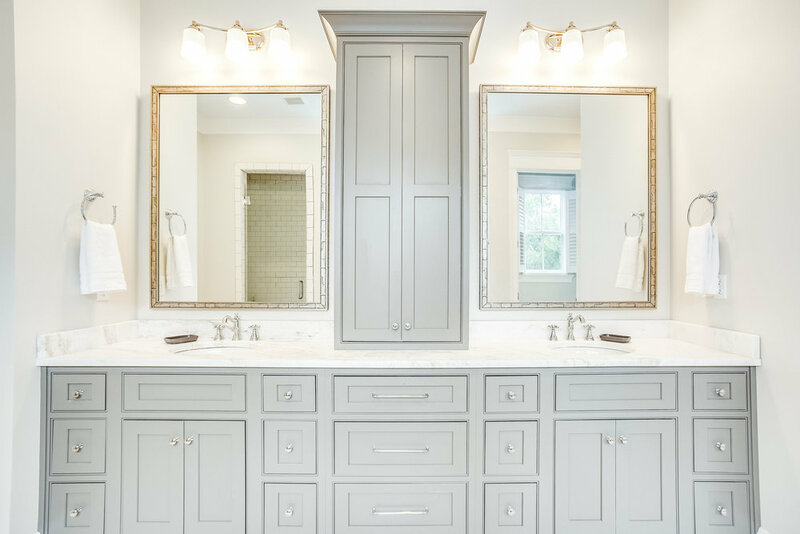 The renovation of the bathroom as well as the kitchen was completed by Toulmin Cabinetry & Design following a fire at the home. The Shiloh Cabinetry vanities with Shaker doors in the Dorian Gray color. The upper cabinet rests on the countertop. Polished chrome cabinet hardware came from from Top Knobs and the countertops are three centimeter polished Castro White marble with a four inch backsplash. The plumbing fixtures are the Delta Cassidy line. An unusual twist on this bathroom is the FEMA approved storm shelter located behind the plain door located at the end of the bathroom. The plumbing fixtures in this bathroom including the tub filler with hand set and the shower fixtures are by Delta. The white mosaic floor tiles and the subway tiles in the shower have a gray colored grout which brings a period feel to this room. 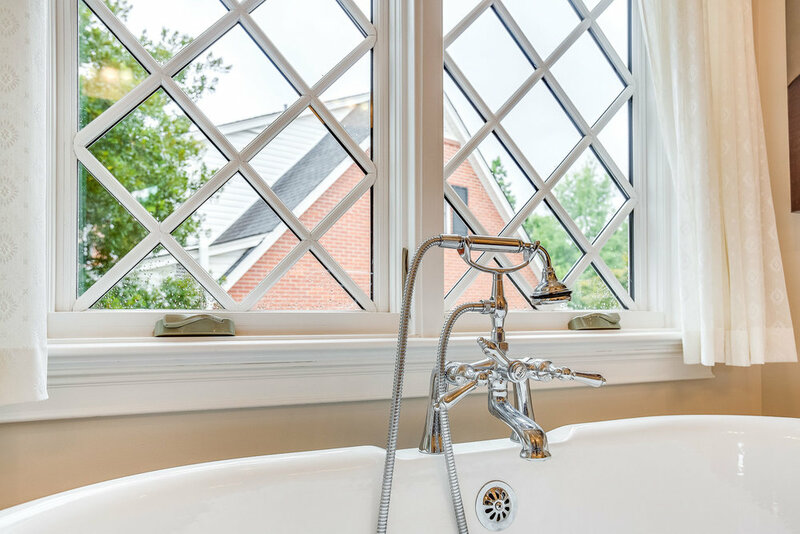 The Sierra Pacific windows have diamond shaped mullions that contribute to the traditional look and feel of this bathroom.